When you start preparing for your Bank IBPS Exam, a lot depends over your preparation level. Also, it depends over the IQ of the aspirant. If someone has already prepared for MBA exam, it will take him hardly a couple of months to prepare for the bank exam. A person who is starting afresh will need about 4-5 months to prepare for the bank exam. Aspirants having good grasp over English and having a good vocabulary stand good chance to clear the exam. Cracking the bank exam is a combination of a lot of elements such as your speed, accuracy, practice etc. The students should give mock tests to analyze their areas of weakness and start working over them. An aspirant must know his stronger and the weaker areas. There are essentially four sections ad each of it requires proper study. In this section you have to keep yourself updated over the latest happening occurring across the nation as well as internationally. The best way to qualify for this section is to study newspaper everyday and make notes from that. The mathematics is just which you have learnt in school. But the trick is that you should know how to solve the question in the shortest time possible. Explore internet for some good short tricks. If you are well acquainted with vedic maths then you have already pavered your way towards success. Try to solve the problems mentally without requiring pen and paper. This is the best way to study and revise. Vocabulary plays a very important role in this section. You need to be either best or at least average in this section. 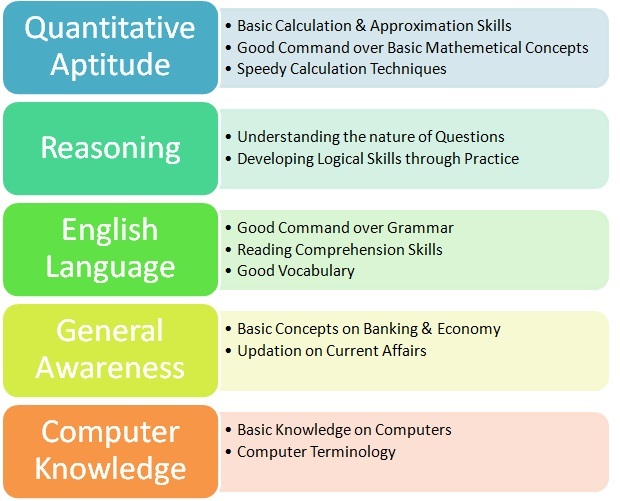 Poor vocabulary may hinder your dream of becoming a bank officer. Reasoning Book, be it verbal or non-verbal doesn’t requires much time to solve. But you can only solve the reasoning question if you have a good practice. Series and sequences are the most important ones. Just solve previous year question papers to get a vivid idea over this. 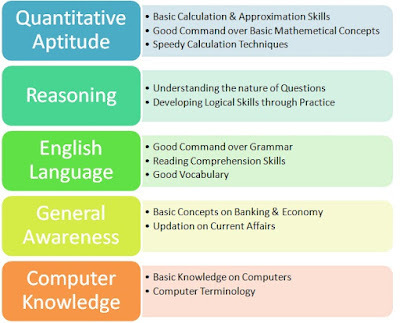 So, let’s discuss what are the ideal qualities which should be possessed by any IBPS aspirant? The aspirant should have a quick hold over his speed. He/she should be able to calculate much faster. The aspirant should be read newspaper regularly to improve his vocab as well as keep his knowledge base updated. Maths and Reasoning section can be qualified by practice but if you are weak in English and current affairs then your dream may be shattered. In which order should you attempt the paper? There are essentially two approaches for this. First, you can start with the section in which you are the strongest. This way you will be motivated and feel good while attempting the paper. This will increase your chances of qualifying the exam. But what if the section you are good at is having difficult questions. You will spend all your time there. So, for that we have a second approach. On receiving the question paper, just give 5 minutes for reading the paper and start with the section which you feel has the easy questions. This way you will save time and would be able to complete the paper on time. As such there are no cut off marks for any section and they are calculated on an aggregate basis. Even the students with Hindi background can give the exam as the question paper is available in both Hindi and English language. But that does not means that he/she will be getting any relaxation in English section. He/she has to struggle to clear the exam. Make it your habit. Read English newspapers or other related magazines daily. This will help you build a flow and keep your vocabulary intact. Reading will also help you in your comprehension section. The trick is to read the passage in minimum possible time and try to comprehend it as fast as possible. Try to focus over the main points and leave out the unnecessary details. Whenever you come across a new word, mark it and learn its meaning, synonyms and antonyms. Reading newspaper and other magazines also build your general knowledge. Make notes for whatever new you find in the newspaper. You should be aware of the basic computer, MS offices, Internet and LAN ,WAN , short cuts of the computers. These act as an added advantage. Make a time table and study as per that. If you cannot afford to study in the expensive coaching institutes then better start self studying. There are many websites which offer study material for free. You can download and get started.